Military Academies and Schools in America, plus Information About therapeutic boarding schools and teen boarding schools. This directory of military schools and military academies is here so you can explore the available options and select the school that is best for you. Some of the most prestigious military academies in the United States are hundreds of years old, but which one is the oldest? A lot of people want to know, so we looked into it. The short answer: United States Military Academy (circa 1802). The long answer: It depends on your criteria. 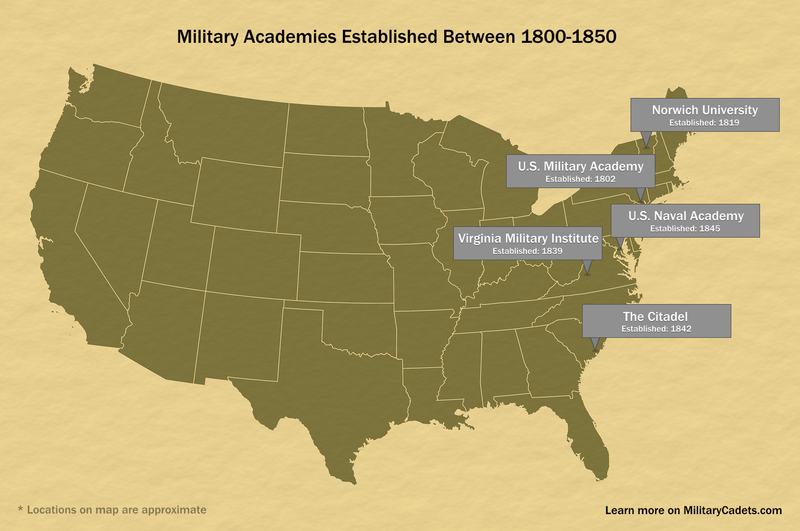 While there’s no reason to suggest that any other school — but the United States Military Academy — is the oldest in the country, there are other long-established military institutions worth mentioning. First occupied in 1778, headquarters to George Washington in 1779, and utilized for training “cadets” as early as 1794, West Point has had an history that’s almost as long as the United States itself. But it wasn’t until Thomas Jefferson signed the Military Peace Establishment Act of 1802, in March of that year, that the United States Military Academy was established. Allowing operations to begin, appropriately, on July 4th, 1802. Norwich University, also known as The Military College of Vermont, is the oldest private military college in the United States. It was established in 1819, but at the time it was known as the American Literary, Scientific and Military Academy. It has the additional honor of being the oldest of six senior military colleges in the United States. For a complete timeline of the University’s history check out this page. VMI is the oldest state-supported military college in the United States. And, unlike Norwich University, it only enrolls military cadets and not civilian students. If you’re a history buff, and we expect you are since you’re reading this, VMI has a splendid archive that you could easily spend hours on. Especially, if Stonewall Jackson interests you — he instructed there. The Citadel, The Military College of South Carolina, makes no claims to being the oldest anything, but it has a rich history. At different points in its life, the site of The Citadel has been: during the Revolution War — a fort, after that — a militia muster site, and before becoming a school — an arsenal. You can read an in-depth history of The Citadel on their website. In terms of federal service academies, the U.S. Naval Academy is second only to West Point in age. You may be surprised to learn, however, that it was not the first naval school in the United States. The Philadelphia Naval School (founded 1838) was a pre-cursor to USNA and most of the faculty taught there prior. Although not covered in this article, the Marion Military Institute (1842) and La Salle Institute (1850) are secondary military schools with histories just as long as some of the academies mentioned here. A higher quality version of the map seen above can be found here. MILITARY SCHOOL ARE NOT FOR TROUBLED KIDS! One of the biggest myths about military schools is that they are for troubled teenagers. In nearly all cases, military schools today are college or military preparatory schools that will not tolerate boys or girls that will cause trouble on campus or in the classroom. Such students are either rejected outright, or are quickly expelled once they get in trouble on campus and the parents are often left footing the bill. If your teenager has behavioral issues, instead of a military school we recommend that you look at a school for troubled teens such as you can find by clicking here. We can also help you in your search for other residential schools for troubled teens, teenage boarding schools, boarding schools, or teenage boarding schools, alternative schools, affordable schools. Military schools offer structure, mentorship and a safe environment that limits distractions and temptations that can detract from academic and personal progress. Still, military schools are not always the right choice for every young person. While military schools offer structure, and academic and athletic discipline in a controlled environment, military schools are not intended to act as a rehabilitation program. Military schools want students who wish to prepare themselves for a future in a collegiate, military, or professional setting.